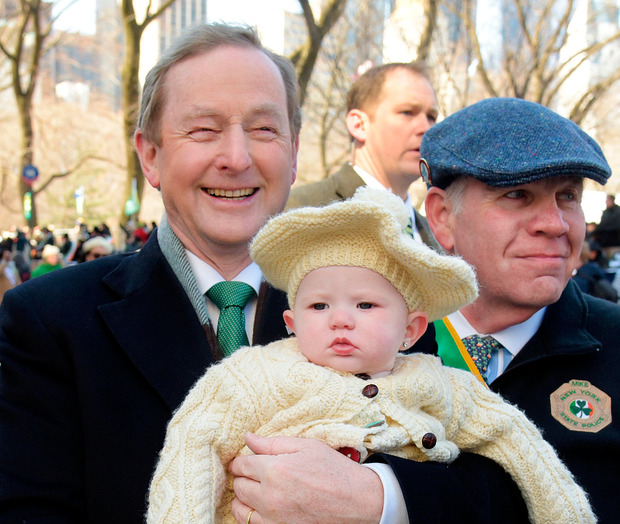 Enda Kenny must be feeling pretty smug today. After a week of police escorts, executive hotel suites, high-powered meetings and endless selfies with overly enthusiastic Americans, he will be a bit jet-lagged but definitively pleased with himself. Even the most humble of leaders would struggle not to feel slightly glorious after the week Mr Kenny has had. The Taoiseach is probably thinking that his party colleagues are mad to be waiting with baited breath for his resignation. Perhaps that's why he intervened to pull a line from a speech in which he was scheduled to publicly acknowledge he's about to step down and is now openly attempting to shoot the bolted horse. But America was his swansong. Deep down, he knows this was a high-point that won't be achieved again. It was an action-packed week of events that even a blizzard couldn't stop. Whatever failings the Taoiseach has in domestic politics, he excels when abroad. If voting rights are extended to the diaspora, he might just give Gerry Adams a run for his money to be the President in 2025. By the time Mr Kenny got to Washington, he had already been the toast of two major cities. He marched the streets of Philadelphia in the St Patrick's Day parade, no doubt humming some Bruce Springsteen to himself. And in Boston he was welcomed with open arms by Mayor Marty Walsh. But his team were still nervous about meeting the new sheriff in the White House, and his army of 'Irish Americans' including alleged white supremacist Steve Bannon, the inventor of alternative facts Kellyanne Conway and motormouth spindoctor Sean Spicer. Mr Kenny clearly decided the best form of attack on the man who possesses the nuclear codes was to love bomb him. The Taoiseach gushingly joked with Donald Trump, who he said had "beat them all, no matter what they say" - obviously deciding the Russians did not interfere with last year's election. The president loved it. He reckoned Mr Kenny was "my new friend, a great guy". And once Mr Trump literally gave Enda the thumbs-up, everybody else fell into line. Paul Ryan, the Republican Speaker of the House, took it to the next level, thanking him "on behalf of Congress" for his "steadfast leadership". "When I think about all the work that you did to set up a government. Coming in after the crash. Turning the economy around. The endless demands. The long nights. The backbiting from the backbenches. "And you made how long in this job? Six years? Bravo. You may have the luck of the Irish," he said to loud applause on Capitol Hill. Mr Kenny demurely waved his hand to dismiss the bootlicking but he was clearly enjoying it. Vice President Mike Pence put the Taoiseach into the same sphere as Mr Trump, extolling their "extraordinary leadership". The grandson of an Irish immigrant, who is now endorsing a travel ban on six predominantly Muslim countries, he credited Mr Kenny when delivering "the prosperity of recent years [that] has been a marvel". And proving the old concept that people see what they want to see, even the 'failing' 'New York Times' thought Mr Kenny provided a tour de force in Washington. The newspaper ran a headline stating "Irish Premier Uses St Patrick's Day Ritual to Lecture Trump on Immigration". It reported that on a calendar of foreign visits that includes the Chinese prime minister and German chancellor, the annual Irish invasion was supposed to be "a delightful distraction". "Yet on Thursday Mr Trump found himself in a roomful of Kelly green-clad lawmakers in the Capitol for the Friends of Ireland luncheon, being lectured by Enda Kenny, the Irish prime minister, or Taoiseach, about the virtues of America's immigrant legacy and the contributions that immigrants had made to the country." In America, Kenny is King. Feted and paraded, with the most powerful people in the world as his personal jesters. Angela Merkel couldn't get a handshake in the Oval Office. That his wife Fionnuala was there for the backslapping only made it better. In his speech, Mr Trump pronounced her name completely wrong but described her as "something pretty special". "We're friends too, right?" he asked. "Absolutely," she shouted across the room full of dignitaries. At the New York parade yesterday, Mr Kenny summed up his journey through Trumpland as "a very successful trip and I genuinely mean that". So how strange it will be today then when he wakes up as a lame duck once again. Back on Irish soil, a large section of voters see the Taoiseach an unloved and often mocked politician. Some within his own party view him that way too. For most of his week away, Mr Kenny managed to dodge questions on his leadership, but it was always going to be front and centre once he got past Washington. On a street corner off Central Park, he was bullish when asked by reporters to clarify his intentions. The Irish Independent put it to him that he must end the speculation because 'Paddy likes to know'. "May I refer the question to you?" he replied. "Do you not think it's appropriate that the immediate priority here is to have an Executive functioning in Northern Ireland? "Do you not think it's appropriate that with all the work put together now we get an agreed negotiating stance for the European Union which is going to affect everybody in our country?" Much as he might like to believe it, the Taoiseach's problem is not a media hungry for stories, it's a party hungry for blood. The party is unlikely to accept another 'fake' deadline for him to clarify his intentions. At the rate things are going, he'll want to be leader when his new best friend Donald Trump comes to visit. Mr Kenny is due some credit for his performance in America this week and in particular for publicly appealing to Mr Trump to "sort out" immigration rights for the 50,000 undocumented Irish. But the problem with getting too much praise is that you might start to believe it.